The human impact is an essential determinant of hydrological behaviours in most of the societally relevant catchments all over the world. There is the widespread perception that the whole globe is significantly suffering from human impact, therefore determining a globally critical situation for climate and water resources management. Actually, most of the globe surface is not significantly human impacted, if one excludes the potential effect of human induced climate change, whose hydrological implications are the subject of a vivid and to some extent controversial debate. However, the most important catchments for society are typically those where humans live and exploit resources and these are of course human impacted, to a different extent. Human impact affects environment in several ways (see Figure 1 and Figure 2). A list of potential consequences is is given here. There is the general perception that the human impact always induces negative consequences. However, the opposite actually happens: most of the consequences of the human impact are positive, as humans make an effort to shape the environment to meet their needs. However, there undoubtedly are negative consequences from the human impact. Unexpected consequences are concerning, especially those originated by non-linear effects that may give rise to the so-called tipping points. Human impact should be adequately considered when planning the exploitation of water resources and mitigation of natural hazards. Therefore, it should be adequately considered in hydrology. Actually, human impact is a key element that is considered by integrated water resources management, but scientists are today dedicating much attention to improving our understanding and interpretation through models of human impact. Methods representing the human impact as an external forcing. 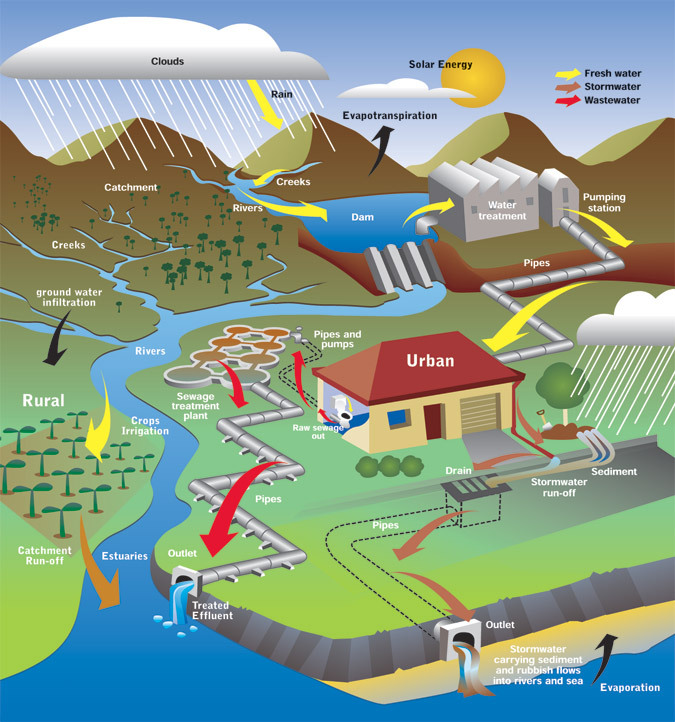 Methods embedding humans an an inherent component of the hydrological cycle. These methods are based on the study of pristine hydrological systems to obtain an estimate of the desired design variable in absence of human impact. Then, humans are modelled through a separate approach, therefore determining a correction of the design variable to take human impact into account. A very simple example is the estimation of the flow duration curve (FDC) for a river affected by upstream water withdrawals. One may first estimate the flow duration curve in undisturbed conditions, and then estimate the amount of water withdrawal which is subsequently subtracted from the unimpacted FDC. This approach may ignore downstream effects of the water withdrawal, like for instance increased infiltration in the river bed given by the groundwater deficit originated by the withdrawal itself. Therefore, the actual human impact on the undisturbed flow duration curve may go beyond the water withdrawal alone. These effects, that may be difficult to estimate, are called "feedbacks" of the human activity into hydrological processes, which are affecting the dynamics of water systems. Therefore, there is an underlying assumption that the human and the water system evolve independently each other. Representing the human impact as an external forcing is a simple solution that in many cases captures the relevant behaviors of the integrated human-water system. It has been used in most of the practical applications, to design water supply systems, urban drainage systems, flood mitigation actions and so forth. Its advantages are robustness and therefore reduced uncertainty with respect to more detailed approaches. The method can be applied to either deterministic or stochastic models. However, in the latter case a probabilistic interpretation of the human behaviours is needed if uncertainty in the human impact is to be taken into account. These methods are based on the integration of the human dynamics into the models leading to the estimation of the design variables. Such embedding generally leads to an increased number of model parameters and therefore to an increased estimation variance, but allows for a possible integration of any interaction between water and humans, therefore providing the means to account for the relevant feedbacks. A simple example is given by a model that may estimate effective evapotranspiration as a function of the water withdrawals, for irrigation, therefore modifying the representation of the hydrological cycle depending on human impact. A relevant question is how to represent the human system, which is very complex by its nature. As for the case of hydrological models, one may decide to adopt a deterministic versus a stochastic approach. The deterministic approach may be adopted by expliciting the dependence of some of the model variables on selected social dynamics, by ensuring feedbacks (otherwise one may fall back to the case of external forcing). A relevant question related to the deterministic approach is its representativity for the human dynamics. While hydrology is by its nature governed by physical deterministic equations, and uncertainty is determined by imprecise knowledge or imprecise representation of the system geometry or measured input and output variables, human dynamics are not governed by deterministic relationships. Therefore, the use of deterministic dynamics is even less justified for human systems with respect to hydrological systems. Therefore, the use of deterministic social-hydrological models turns out not to be useful for engineering design. Their application may serve for improving our understanding of the outcome that may result from assigned conditions, namely, to assess "what if" scenarios. Describing the combined human and hydrological system as a physically-based stochastic approach presents the relevant opportunity of describing uncertainty. However, proper assumptions are needed to make sure that uncertainty is properly represented, and testing should be carried out to ensure that models are reliable. By no means the hydrological model should be combined with improper or unreliable representations of interlinked processes. In fact, while an incorrect external forcing does not impact the inherent uncertainty of the hydrological model, an integrated representation presents the relevant risk of making the hydrological analysis unreliable if the links and feedbacks are not properly described. Therefore uncertainty analysis, through statistical testing and model selection, is an essential tool to decide whether it is the case of combining water and human dynamics rather than treating humans an external forcing. There is the general perception that estimating uncertainty for hydrological models is a challenging task. Actually, one only needs the identification of any relevant uncertainty source and running the simulation models for several different values of any uncertain external forcing and/or parameter, extracted from suitable probability distributions. Finally, one should add to the obtained simulations the structural error of the adopted modelling scheme, whose distribution must be properly assessed, preferably through model validation. A blueprint for uncertainty assessment is described by Montanari and Koutsoyiannis (2012). The theoretical part of the paper is essentially technical but the applications therein presented are conceptually simple. which is affected by randomness, within a hydrological model. One should consider that the uncertainty of the resulting estimation may be inflated, for the random evolution of the human system that is superimposed to the random evolution of the hydrological system. Therefore, the opportunity of increasing the model complexity should be evaluated in light of the resulting uncertainty in the design variable.